Paul Greengrass really knows how to direct films with tension like few others. I really tend to avoid super high-tension films like that when I am aware of it before going in. Greengrass's UNITED 93 is another one like CAPTAIN PHILLIPS that I waited to see on DVD because I just knew going in that the tension was going to a bit much for me. I think I chose correctly in both those cases. Watching them for the first time at home on the smaller screen and distractions made the intensity easier to bear. It is an excellent film. I was never bored by it and got fully wrapped up in the events unfolding and that relentless sense of inevitability to the outcome. I know many will have gone into this movie already knowing the story, but I am not one of those. The 24-hour news cycle is not something I choose to partake in so when this even actually occurred I was only peripherally aware of it and was completely unaware of the specifics of how it ultimately resolved. Everything other than knowing that Capt. 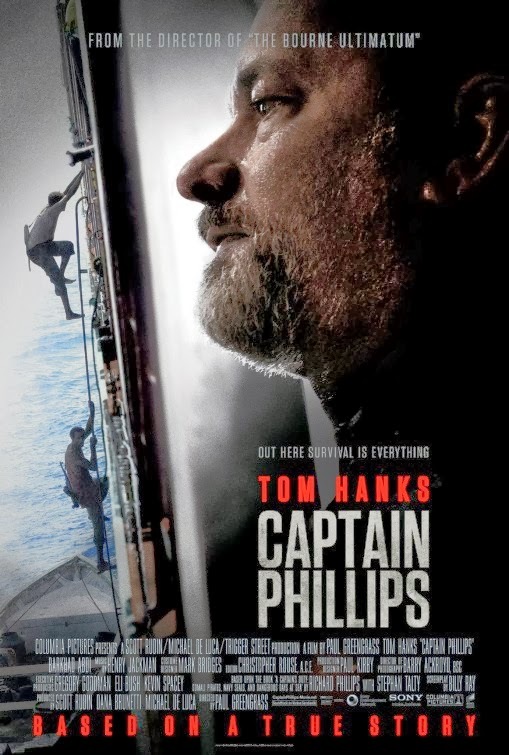 Phillips was in charge of a boat taken over by Somali pirates was all I knew. There is no attempt to justify the pirates' actions but there is humanity to them. There is some sense of futility to their lives that earned them pathos and empathy as I was watching it. Tom Hanks earned himself this year's Oscar nomination in this performance which felt honest and real all the way through. The film is excellent, but I wouldn't say it was the Best Film of the year but I can see why it got the nomination.